LIMBO is one of the most special games I have ever played. I wanted to write up a quick review for this game despite it being about a year out of date; but recently the title became available on Steam and so I’ve finally had a chance to play this game after waiting for ages. In short, LIMBO is a platforming and puzzle solving game with a stunning art style. You play as a nameless boy who has just awoken in Limbo (otherwise known as the edge of Hell) and to say anything else of the plot would ruin it for you. Though, that said the game is minimal in every regard, including the enigmatic plot. LIMBO is a great example of visceral storytelling and the mute protagonist reflects perfectly, the world of barren despair and death which you traverse. This game world is a punishing one; you will die often – the developers coined LIMBO ‘- a trial and death game’. But that’s fine, the puzzles escalate to an almost punishing level by the end but once you come to the solution you might kick yourself that you did not realise it sooner. LIMBO’s gameplay is roughly 70 percent reliant on these puzzles and so it is testament to the level designers at Playdead studios that their puzzles can be only slightly frustrating but always solvable without guides. I had to only quit the game once when I was stuck on a puzzle, but after stepping away and coming back to it I worked out the solution. I finished LIMBO in 3 sittings, and for a game that took me about 4/5 hours to complete that should reflect the addictive nature of LIMBO’s gameplay and immersive gameworld. But whatever you do, don’t be put off by the short campaign length. There’s no multiplayer but I am already excited to replay LIMBO, it is the perfect length for a game as avant guard as it is. I must not finish without talking about the game’s stunning art direction. I have played many beautiful, cinematic games with Shadow of the Colossus being my other most notable choice for amazing art in a game. However LIMBO is completely unique and instead of being grand and epic, it is suitable poignant and minimal through it’s clever use of black and white, the dusty vignette and the constantly flickering light sources, a reminder of lights preciousness and frailty. Overall I could not recommend this game more. It’s beautiful, addictive and totally unique. I don’t review games enough to give it a numeric score but this is my final word on LIMBO. LIMBO is available of XBL, PSN and Steam. Setting Up Your WordPress Blog :: The Essentials in Less Than an Hour. Starting a WordPress blog? Read this and have your website up to par in less than an hour. So recently I helped my friend out by recommending way she could tighten up her blog a bit. I thought that actually these points could help anyone starting a WordPress blog; these tips are for anyone starting to blog and who wants to start out with a base level of quality. These are very easy steps and I have images to guide you through, if you found this post helpful PLEASE show it your friends. Hyper-Linking is really important because not only are you helping your readers out by saving them work, but your also sourcing content and potentially gaining referrals (when a website sees you have linked to them, and therefor link back to you). In the image below, I have selected the only tools I use from the visual editor on the New Post screen of WordPress (the visual editor is by far easier to use for people starting out, don’t worry about the HTML one). These are the only button I use, and all I think the basic blogger really needs; I won’t explain them all in detail because most of you will be familiar to most office-type document programs (For many of you this means Microsoft Word). However the WordPress interface makes it easier to hyper-link than you may be used to. See below step-by-step instructions on hyper-linking (Image will probably have to be viewed full size as it’s very long, sorry!). 1) Click the icon that looks like a chain. 2) The hyper-link box appears, leave it for now. 3) Go to your desired website, select the address and click ‘copy’. 5) After link is pasted just click ‘Add Link’ it’s that easy! 6) You will know your word has been linked to something if it turns purple and is under-lined (The text will also become a different colour on your blog, this depends on your blog theme). Check out Matt Knight by clicking here. The internet moves fast, we don’t want to be wasting time copying email addresses and then pasting them and then… Jeez, I’m bored already! Contact forms make it easier for your readers to contact you directly, plus it means that you don’t have to give out your email address to any potential deviants (NOTE: WordPress does not promote deviancy!). WordPress actually offers a very comprehensive tutorial on adding contact forms, I promise that all it essentially takes is two clicks. I just wanted to include this as a note, because it’s very tempting to just post your email address and leave it, but I promise this is a lot better way to promote contact with your readers, plus, it just plain looks better. You’ve heard of friendly faces right? Well you’ve probably never heard of friendly names, that’s because putting a face to a name creates another dimension to your blog, it grants it humanity. An About page does not have to be labored over, going over each detail until it’s perfect. It needs to be short and to the point; people aren’t going to try and trip you up, usually they just want to know a little about the person who’s website they are visiting. 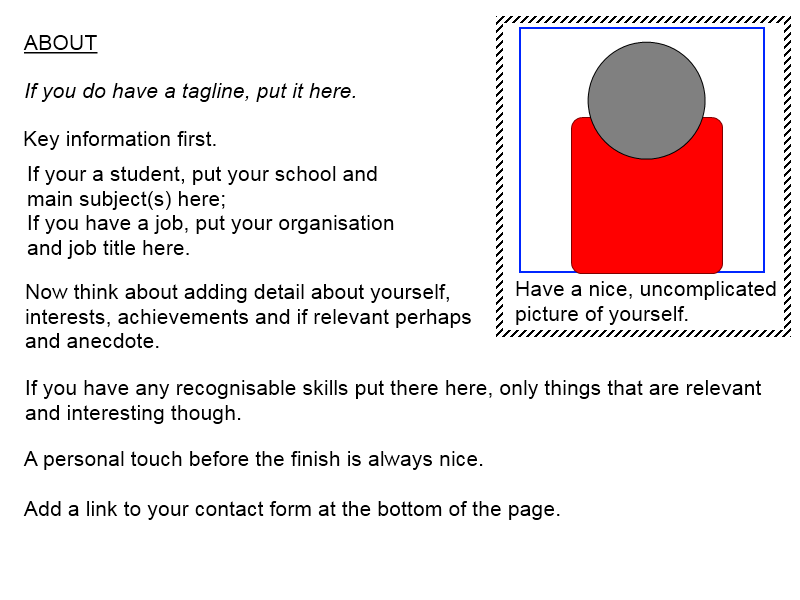 Below I’ve mocked up my ideal About page, there of course are a lot of variations on what you can do, but I feel these are the detail that MUST be included-add any personal flair after you’ve administered these steps. The picture says it all really, but here’s a few more details. i) The school/ organisation area is a place to ground yourself in reality, there’s no need for any real detail here. 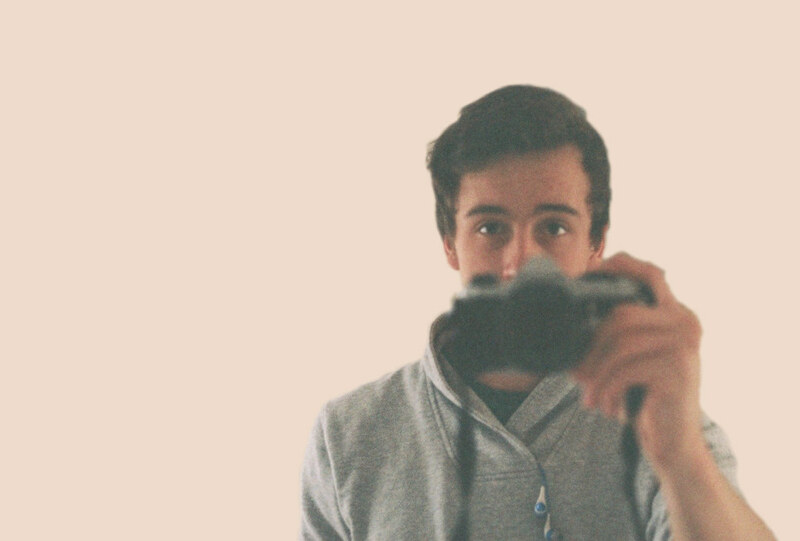 ii) In the picture of yourself, make sure it’s you and only you. People don’t want to be trying to work out who you are from a group photo and make sure you are smiling! (If you don’t have picture of yourself anywhere else on the blog, this is a really important addition). iii) When you add some personality to the page, keep it concise and relevant; if you blog about films say what you love about them and perhaps mention your favorites but don’t talk about directors or effects you like-this about you, not about your subject. This applies to any subject: art, culture, gaming… anything. Talk about why you’re invested in your subject area and leave it at that. iv) ONLY list skills that employers will recognize; there is no need for school grades here. Mention things that will make people respect your opinion. The majority of you probably won’t have these (I know I don’t!) in which case just try and win over your audience with this space; just be nice. v) You may think you’re the most original person in the world, but you’re probably not. Have a look at other blogs before adding something you think is funny and original. This isn’t a set rule, but it’s often nice to stand out if possible. For my blog I added a list of things you shouldn’t know about me, it’s a dig at myself and I hope it reflects good humour! I’m sure though you can think of much better ways to promote yourself, so experiment and be creative! By default WordPress gives you this; so don’t be stupid like I was and delete it, because you can’t get it back! However if you do, you can apply my very (un-elegant) solution. It’s straight out of the idiots guide to blogging, but it does the trick. Simply create a Category called ‘Home’, add it to your menu and and then tag EVERY post in this category. If you have a lot of posts already, just give up on them (apart from your 5 most recent) they are just lost to cyber-space, move on. As long as you remember to click this category before you publish no-one will ever know! So, that’s it. I hope this post helped you and if the clock ran over one hour I’m sorry, but there are no refunds. If you have any questions just leave a comment on this post or of course you can message me via my contact form. So I just wanted to let you know that I decided to change my approach to my current project ‘The Balloon’. You may have seen my previous post saying that I was developing ‘The Balloon’ in mind of making it a kids book; but then I though about it more. I realised if I made it into a web-comic like Diary of a Boy at Sea then things become a lot more simple. If I try and make it a kids book, am I going to go and try and get it published? No. As a kids book, will there be a bigger work-load? Yes. Will I have more fun drawing my own project? Yes. Will more people be able to enjoy it as a web-comic? Yes. Easy really huh? So that’s what’s happening now, you can see below the first page, but I won’t be posting anymore until it’s finished! Hope you’re all good; just thought I’d update you guys on some of my plans to update my website. As someone passionate about design and effective functionality, I’ve had a re-think about my portfolio site. I’ve been inspired by endlessly pouring over other designers sites, and though I am not a designer through and through, I am highly creative and I feel my website could be a little better looking. So I drew up some very early concept images and am in talks with my amazing friend Harry Finn (Seriously, he’s a web-design guru, you might want to follow him on twitter too); he’s told me it’s possible and is hopefully going to help me through these changes. See what I have planned below, I think it has a good balance between a clean, functional design without being to distracting. The designs (rough as they are) are mine so please don’t copy them, if you do however take inspiration from them I’d love to see how they come out! So I just finished off making my 404 page and though it’s nothing too fancy I did experiment with some more creative images to substitute the typical ‘404-Not Found’ error message. Find below a collection of 404 image banners that you are free to download, edit and use on your own sites; if you do this all I ask for is a comment on this post saying which one you downloaded and where your site is availiable so we can all see it in action! For those who are unsure, just click any of the images then click ‘View Image’ then click ‘save image’ from there to get the full size. I Hope you like these designs guys!